Working my way through a rake of stuff I've taped (or 'recorded' if you must) off the telly. First up, a double bill from back in the day. Yes, they did actually make films back then, you know. 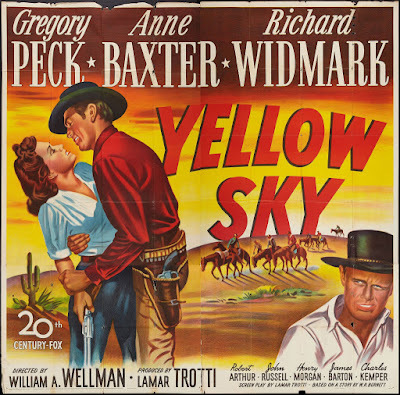 Yellow Sky (William A. Wellman, 1948) is a watchable Western about a gang of bank robbers (led by Gregory Peck) who end up hiding out in a ghost town, where the only inhabitants are an old man and his granddaughter Mike (Anne Baxter). 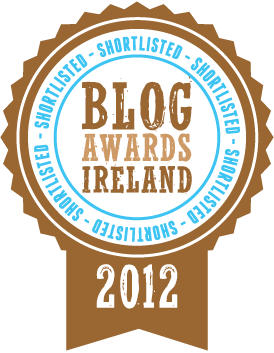 Tensions start to rise as the gang compete for Mike's affections and discover the old man may have gold stashed nearby. The source novel drew inspiration from The Tempest, but Wellman was apparently unaware of the plot similarities, so the complexities of the play aren't explored here which seems like a bit of missed opportunity. However, it does feature some striking photography in the early scenes in particular, while Baxter delivers a feisty performance in a more substantial female role than many Westerns offer. Although it is tiresomely inevitable that the script demands she succumbs to the (rather rapey) attentions of Peck's character - indeed it is notable that the nominal villain (Richard Widmark), simply by pretty much ignoring her, treats her more respectfully than the other men. Anyhow, it's a solid enough oater for the most part, but a risible ending undermines it a lot, and will no doubt leave Western fans, bank robbers, and women in hats shaking their heads sadly and rolling their eyes to heaven. Turn it off before that bit. 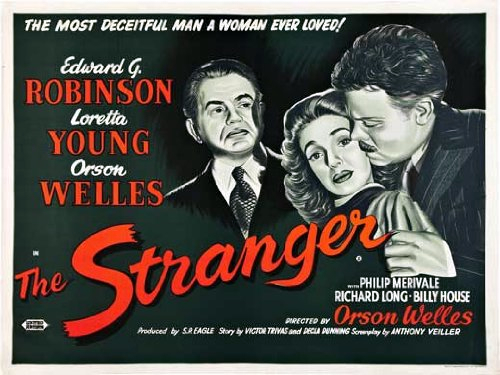 Everyone says The Stranger (Orson Welles, 1946) is Welles' weakest film as a director, lacking the depth and distinctive visual style of his other work. But when I actually sat down to watch it....it turns out everyone was right. It probably didn't help that Welles only accepted the job in an attempt to re-establish his reputation in Hollywood following the debacle of his Magnificent Ambersons project four years earlier. The story of a dogged investigator (Edward G. Robinson) who tracks down a Nazi war criminal (Welles himself) to a sleepy American town was straightforward thriller material and all Welles had to do was turn in the film on time and under budget, which he duly did. However, he had to cede creative control to the studio, thus restricting him from doing anything more interesting with the material. He did squeeze in an impressive tracking shot and it is also notable as the first feature film to include real documentary footage of Nazi concentration camps. However, the studio insistence on a short running time means character development is lacking and Welles' own limp performance reflects his disdain for the entire project. It amounts to nothing more than a serviceable noir, but remarkably it was the only film Welles directed which actually turned a profit at the box-office on original release, so it did pave the way for him to go on to greater stuff. however much he disliked the experience. 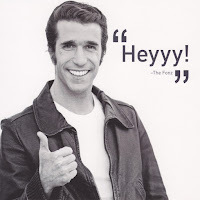 Next time, stuff from the 50s!